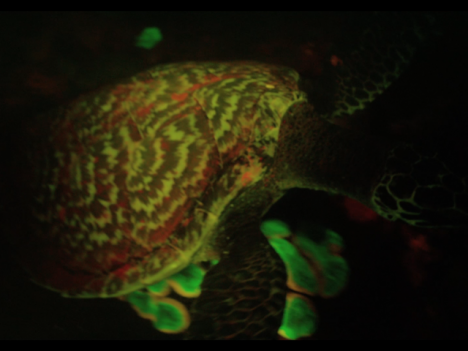 Scientists have discovered the first example of a bio-illuminated reptile in the form of a fluorescent turtle, found while filming surrounding sea life in the Solomon Islands. 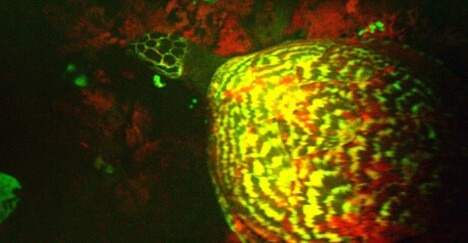 This critically endangered hawksbill sea turtle had been previously documented but never exhibiting illuminating behavior like this variety. Marine biologist David Gruber of City University of New York found it swimming amongst sea life while taping coral and fish. 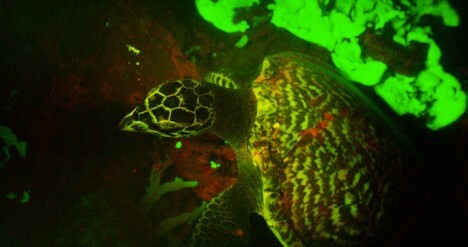 Unlike bioluminescent organism, the turtle does not generate its own light but reflects blue lights as other colors. See more in Earth & Nature or under Science. October, 2015.